Crocheted with super bulky weight yarn, this scarf is the right thickness for the cold, winter weather. I love the look of chunky scarves, but dislike the stiffness that is associated with them. This pattern is designed to have easy drape, so that the scarf won’t feel like cardboard! The secret is the broomstick lace technique. Broomstick lace is typically used for dainty lace patterns, but when combined in this scarf pattern with the bulky yarn it is the perfect combination of soft and thick. The scarf is also reversible, with a ribbed pattern on one side and a subtle striped pattern on the other. Wear the scarf with your favorite side showing, or twist the scarf so that you can see both complementing patterns. 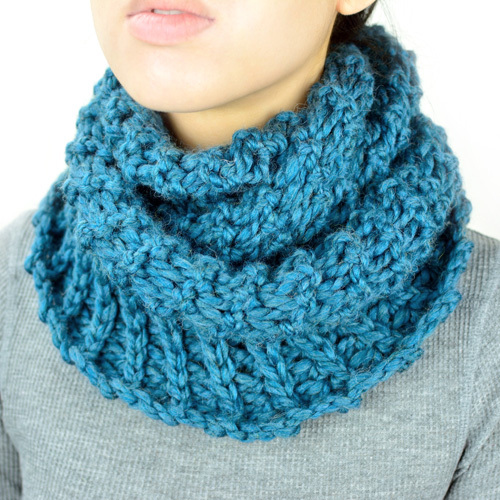 The scarf has an infinite loop shape that can be worn loosely around the neck, or tight like a cowl. This entry was posted on Sunday, January 17th, 2016 at 10:24 AM by Rachel Choi	and is filed under Best Crochet Patterns. You can follow any responses to this entry through the RSS 2.0 feed. You can skip to the end and leave a response. Pinging is currently not allowed.